Swivel and Tilt LCD Plasma TV Bracket 32" to 50"
This universal articulated TV Bracket is suitable for screen sizes from 32" to 50" and comes with all the neccessary parts to fit your TV to the bracket aswell as fixings for solid and stud walls. The bracket offer swing aswell as vertical tilt and is ideal for installing TV's into the corner of a room. 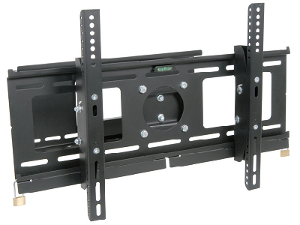 The TV Mount also features a locking bar so that the TV cannot become accidently de mounted. The mount is suitable for LED and Plasma TV screens up to 50kg. Another great feauture is the ability to adjust the horizontal alignment of the tv mounting mount after the bracket is wall mounted ideal for minor adjustments at the end ensuring a perfectly level installation. Screen Size : 32" - 50"